This chapter deals with the physiology of consciousness2 apart from the physical brain and the mind. From a spiritual point of view, consciousness per se is eternal and in its infinitude remains always beyond grasp3. Conscious beings ‘swim’ in that universal consciousness and can unify themselves with aspects or parts of it. During a long cycle and sequences of subcycles they do just that. Thus they learn to become self-conscious of various aspects in which infinity can unfold itself. Mind is the unfolder and at the same time the limiter of what we will encounter on our scientific pilgrimage. There is mind only – mind is the only cause of existence. Each existence has its own stage of development ‘in the middle of its own eternity’ as it were. It is a long and arduous, but Self-chosen process that is inherently extremely joyful – if we but were not so stupid to bump our heads all the time by our ignorance and self-caused ambiguity of mind. Pristine Consciousness issued Mind in order to gain self-consciousness. The mind needed a vehicle in (physical) matter and developed it. Not the limited human mind – which is but a minute splinter of the cosmic mind or Mahat – because even with all our scientific understanding we can not even make a technological copy of the simplest ganglion. The Mind is not ‘somewhere in heaven’ or a property of ‘God’ or one particular ‘Designer’, but is omnipresent like the rays of the Sun wherever there are ensouled beings to shine on. Mind transforms matter into forms in the particular rūpa-loka (form realm) to which they belong. The cosmic mind ‘steps down’ through various phases of subtler matter and down into physical matter where its influence leads to physical forms, in order to perceive and gain self-conscious understanding of our present small world – the tiny Earth, and even that in a limited aspect. It is interesting that the ancient thought systems, though probably ignorant of nerve cells, axons, synapses and the physiological details about functional regions in the brain and ignorant about other modern findings, were aware of the aspects of consciousness which the brain serves i.e. the sense perceptions and also so-called extra-sensory perceptions. The last are potentialities which existed already in our inner being before we surrounded ourselves with the physical molecules of our plane of existence. They were also aware of an inner physiological system in the form of energetic information channels (tens of thousands of nāḍīs ‘rivers’. ), centers of energy (known as ‘chakras‘ ‘wheels’) running through the body. Tantric Buddhism, for example, has given much attention to the nāḍīs and their deities in order to bring about specific magical effects and to broaden or deepen aspects of consciousness. This aspect of magic is nothing but application of knowledge of the invisible physiology. This is an example of the application of ancient science and in combination with the Buddhist effort to contain it under the strictest discipline of practical selflessness and active compassion. Healing methods, like the various acupuncture systems in the world use detailed experiential knowledge about ‘energy channels’ for healing purposes. It is generally known nowadays that there are seven chakras along the spine that are related to physiological and psychological processes. Actually they are said to be vortices of energies at the interface of a grosser and the next more subtle plane of matter. According to clairvoyant reports these are whirling centers (perceived in various colors) of energy running in fixed numbers of loops. In yoga these loops are often referred to as ‘lotus petals.’ The chakras are the interfaces through which the subtler body (in the modern Theosophical literature referred to as liṅga śarīra – or also as ‘astral’ or ‘etheric’ body) communicates with the physical plane, and they relate directly to our ganglia and endocrine system. All have a communicative function, and can transfer information from subtler plains of matter to the physiological plane. Before the physical and astral planes are reached, the planes of desire and mind and of still loftier impulses communicate down to the astral plane, and from there to the physical plane, which also contains the brain. Thus the planes of desire, mind and spiritual intuition exist above or beyond or inside the physical brain working into the brain rather than being a product of it. Moreover there are said to be seven chakras in the brain, related to specific brain functions relating to consciousness – which would have to be correlated scientifically with the functional regions in the various brain lobes. However these seven chakras in the brain do not necessarily correlate with the functions recognized by science, being as it is mostly on the level of physical phenomenal sense perception only. Some of the brain chakras are associated with known parts of the brain, such as the hypothalamus and the glandula pinealis or pineapple gland (The last was even in Europe mentioned as ‘the principle seat of the soul’ and ‘the third eye’ by the French-Dutch philosopher Descartes in the 17th century4 and has been frequently confirmed by yogi’s and occult writers, but this has also not yet been confirmed or understood by main stream science.) 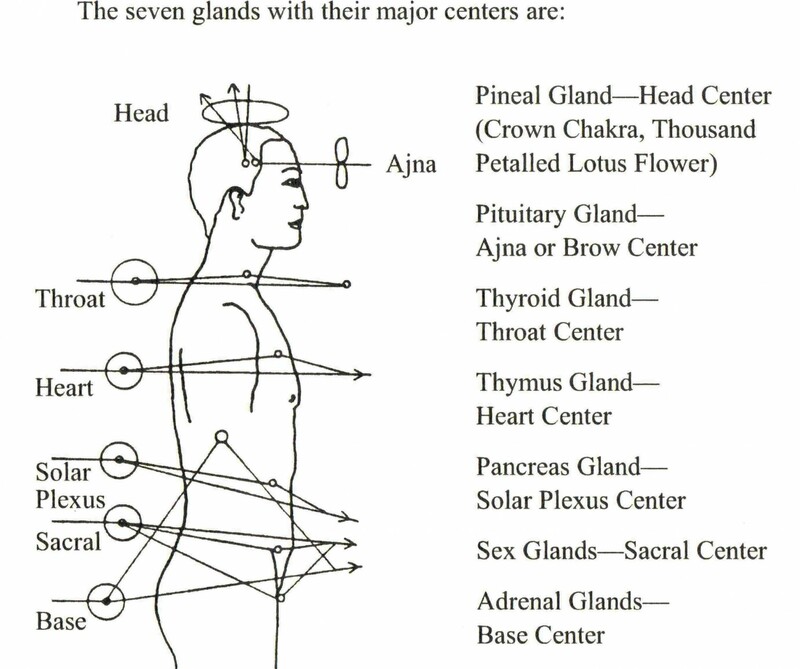 Some chakras relate to the hollows (fluid filled ventricles) – which are physiologically just ‘empty’ for science. The higher functions are as yet imperceptible for the coarse scientific methods. 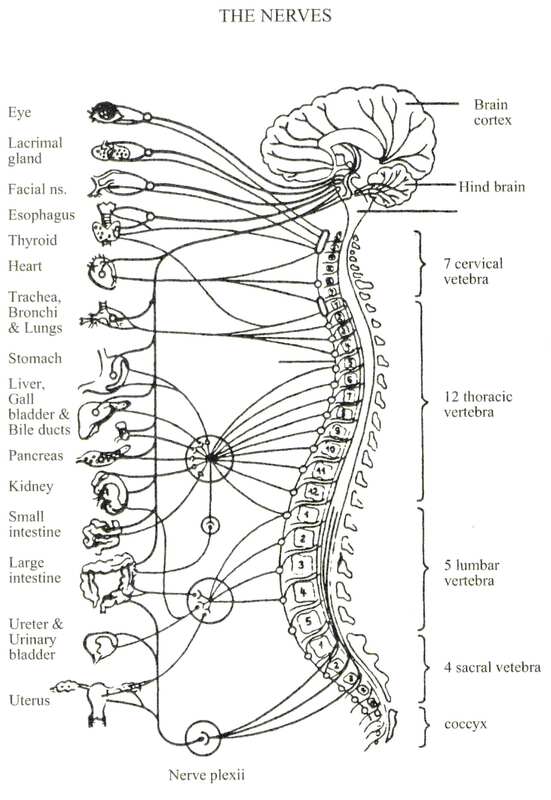 Besides the seven chakras along the spine, from which branch out groups of nāḍīs to provide prāṇas to all parts of the body, there are said to be 49 minor chakras (smaller wheels which less loops) and 7x7x7 (=243) micro-chakras (Hopking, 2004). Apart from these there are interfaces or chakras on cellular level where the soul (jīva) of the cell through subtler matter communicates with the physical matter of the cell and thus steers information which impacts the processes inside the cell. (De Purucker 19735). The souls or jīvas of the individual cells in a body are at the same time under the direct guidance of the ‘oversoul’ or individual soul of the human or other being of which it is a part. Modern epigenetics has already proven this on the physical-physiological level, but it must be even more true on the more subtle levels. This, then, if the perceptions are correct, means that every single nerve cell has its interface which its own individual jīva or soul, and through this with the human or animal jīva. All chakras have a physiological representation in the nervous and endocrinal system or by an organized structure inside the cell. 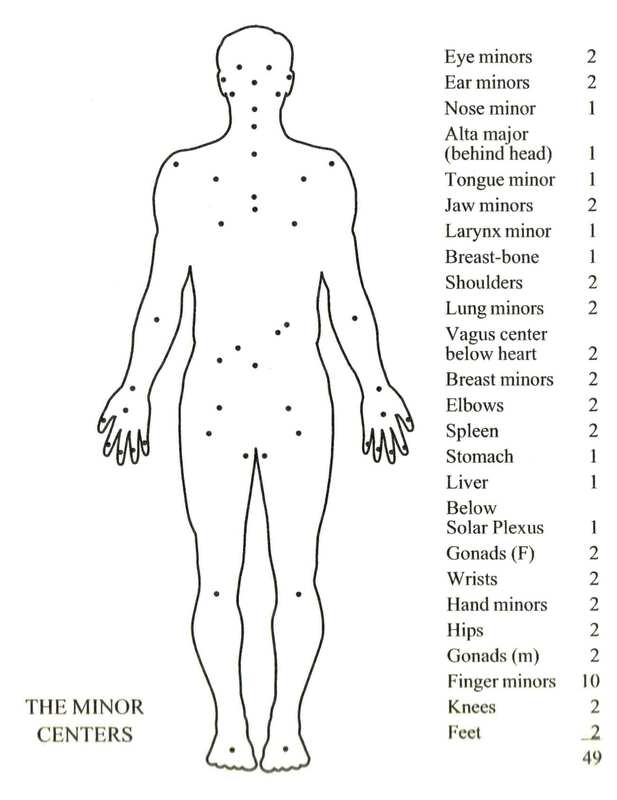 However, the chakras are not the ganglia etc. themselves. The ganglia and the physical brain structures are just their representatives (cf. Hopking, 2004), developed (by the jīva) on our present plain of functioning. Comparable systems must exist for all invisible beings in the many gatis, i.e. locations or states of existence, and sub-states described by Jainism, Buddhism, Theosophy and other systems. These findings by modern clairvoyant investigators confirm ancient knowledge, but are not yet recognized by modern science because their findings can neither be checked nor falsified. This is the right attitude from the point of view of brain scientists or neurologists, because science needs much effort to protect itself from humbug. Regrettably the ancient sacred, and once hidden physiological knowledge of chakras, nāḍis and prāṇas has partly falling in the hand of people who do not have a very scientific mind and who are more interested in the ‘romantic’ feel-good and pseudo-scientific side of this information. This knowledge can become a boon or a curse for medical science, once understood. Not only can one heal, but one can also exert unsolicited influences on human subjects, and thus perform black magic – not an option where our present state of world’s and individual ethics is ready for to handle.